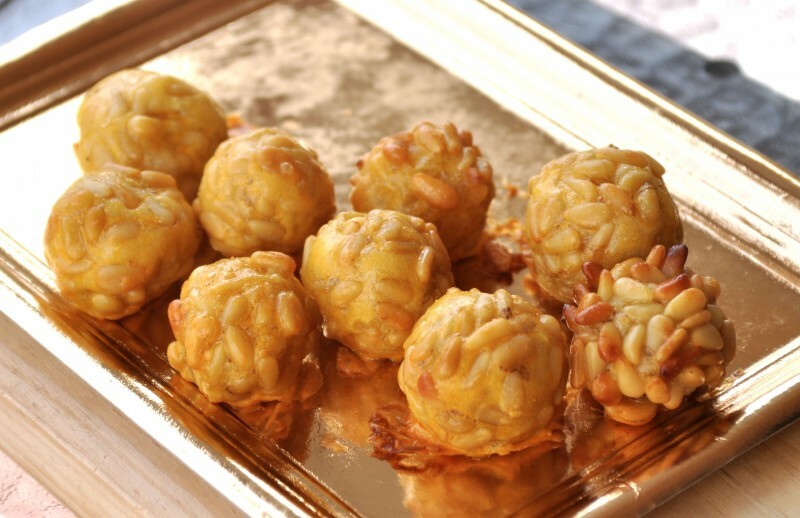 One of the most enjoyable aspects of visiting any new part of Spain is seeking out those special local delicacies or typical food products and in Alicante there is one name which is synonymous with sweet-toothed treats: Turrón. Turrón is a sweet nougat, typically made from honey, sugar, toasted almonds and egg whites and usually shaped into a rectangular bar or a round flat cake. It is sold in markets, pastry shops, street corners, cafés, supermarkets, and of course, stores dedicated to selling Turrón itself. Turrón is traditionally consumed in Spain in the months leading up to Christmas, where it can either be enjoyed as a sweet family treat at home or given as a gift to colleagues at work, although the confectionary is also eaten during the rest of the year as a tasty dessert, sometimes in the form of flan, tarts or ice-cream, or used in sweet sauces to accompany meat dishes. Turrón can take on a variety of appearances and consistencies, although the two principal varieties are hard turrón from Alicante and soft turrón from Jijona. Hard turrón is made from a mixture of honey, sugar, egg white and whole almonds and is crunchy and brittle, whereas soft turrón is made by grinding those same ingredients into more of a liquid form, so that the end product has a creamier, chewy texture. Hard turrón is produced using special mills that grind and mix the ingredients into a liquid form before the mixture is then cooled, pressed and poured into oblong boxes lined with cling film or grease proof paper and patted down, covered and set to harden. Soft turrón is made by the same process but with an extra mixing stage to create the creamier consistency. Originally turrón was made by the Moors in the small town of Jijona in the northern part of Alicante province, a municipality home to almond trees and aromatic plants. 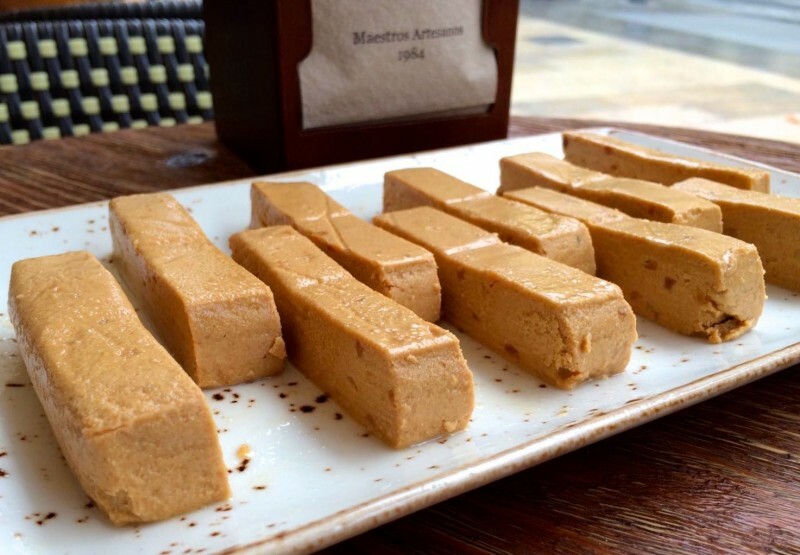 For over 500 years, a considerable part of Jijona’s economy has been based on the production and marketing of turrón in the winter months and almond ice cream in the summer. The turrón of Jijona even received special praise from King Felipe II during the 16th century, consequently doubling its popularity, as demands for the product spread from regions across the whole of Spain. 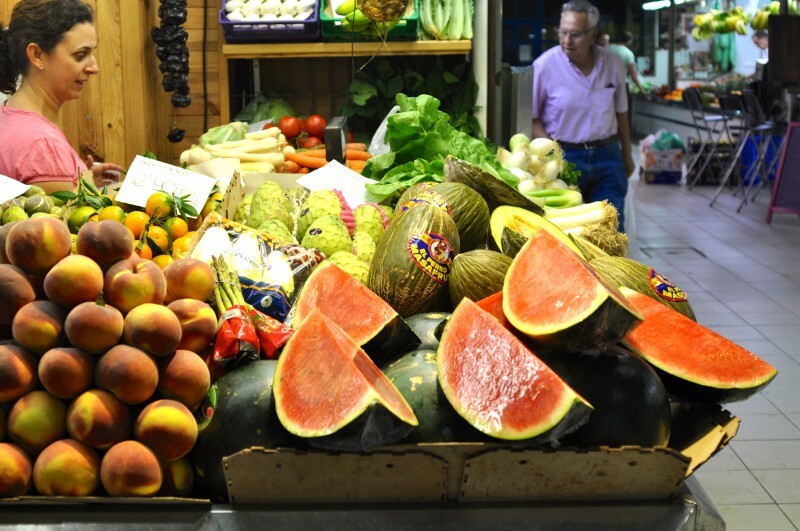 By the nineteenth and twentieth centuries the people of Jijona and Alicante began to emigrate to Cuba and other parts of Latin America, where their nougat was equally appreciated and became a part of local culture there as well. Traditionally, much of Turrón production was undertaken on a small scale in a domestic environment. Between the months of September and December the families of Jijona would make turrón in their own houses, and then in the days leading up to Christmas they would travel all over the country selling bars of turrón to customers who recognised the Jijona products by identifying the traders who would always wear their hometown’s traditional dress. After many years Jijona remains the turrón capital of Spain, with a number of brands and artisan factories whose businesses continue to thrive particularly during the colder months, although Alicante city follows closely behind, with their hard turrón being particularly popular amongst tourists. Production is now undertaken on a larger scale and has become a large business in the Province. 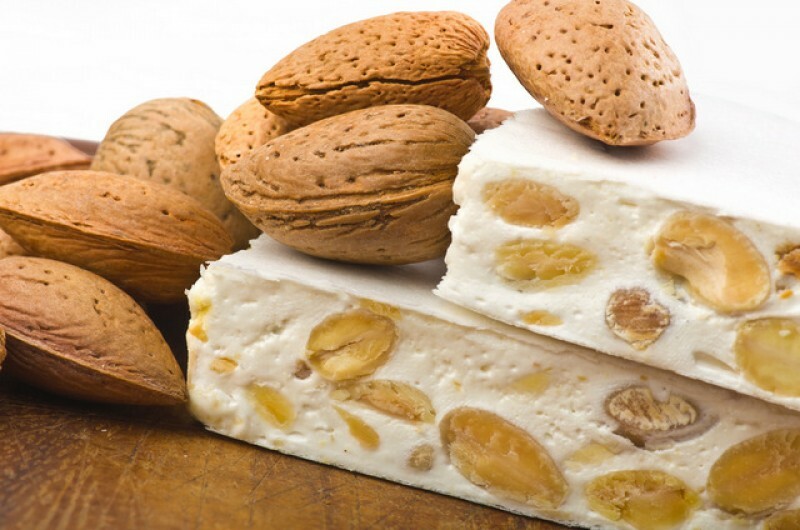 Only the turróns that are made in Alicante and Jijona receive an official ‘Denominación de Origen”, which is a ‘product of origin’ quality seal that officially recognises the turrón as being of high quality and made using only the traditional ingredients; honey, sugar, almonds and egg whites. Thirty years ago almost all turrón recipes followed these specific natural ingredients, but nowadays due to such a diversity of products on the market there are many more varieties available, including turrón with grated coconut, chocolate, puffed rice, candied fruits, walnuts, peanuts and even whiskey, all competing for business. The ‘Denomincación de Origen’ only gives its seal to the manufacturers who use the four original ingredients and traditional methods of production. For example, each bar requires at least 60% almond mixture to be classified as authentic turrón, and only almonds from Spain are used in the production rather than manufacturers importing cheaper almonds from other countries. If visitors in Spain are looking for the real turrón, they should stay clear of supermarkets and ‘too good to be true’ prices. As a rough guide, a normal price of a proper bar of turrón from Alicante or Jijona will cost between 6-12 euros and will always be labelled with the official seal that says “Consejo Regulador de Jijona y turrón de Alicante”. 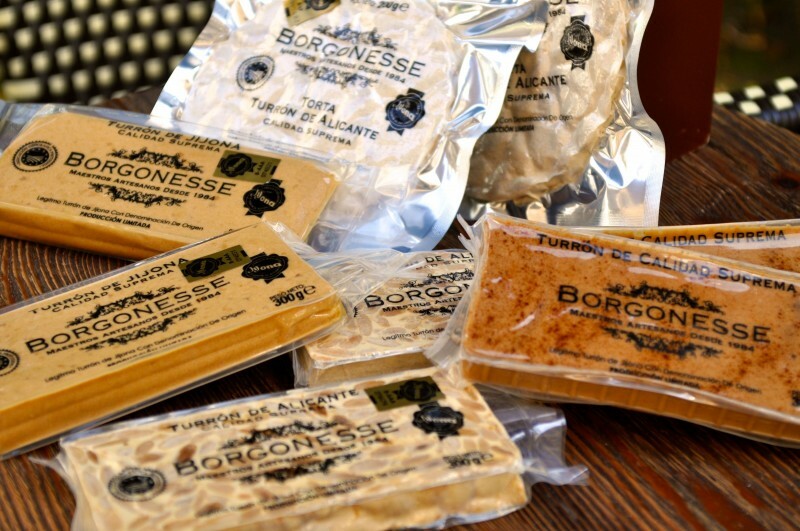 Three popular turrón stores in Alicante city are Borgonesse, located on the Rambla Méndez Núñez, Turrones Espí in Calle Tomás López Torregrosa, and the pop-up shop, Alberto Monerris Sirvent which is right next to the entrance of the Mercado Central, where many other typical Alicante products can be purchased. It is also worth visiting the Turrón museum and factory located in the industrial park just three kilometres outside of Jijona and 26 kilometres from the city centre of Alicante to learn more about how the product is produced.